As the young girls have discovered the truth about the cruel fate of a magical girl, one magical girl after another is destroyed. Throughout it all, there is one magical girl who continues to fight alone – Homura Akemi. 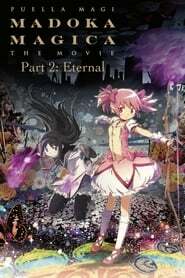 Puella Magi Madoka Magica the Movie Part II: Eternal is a retelling of the second half of the TV anime series.